The Classic Yacht Thelma was launched in 1897 and was regarded as one of the greatest creations by the famed Logan Brothers. Thelma was the largest race yacht ever built by the Logan Brothers and no expense was spared. After nearly 70 years out of New Zealand, Thelma was purchased by the Classic Yacht Charitable Trust and returned to Auckland from the Mediterranean. In an article in the New Zealand Observer dated April 3, 1940 Thelma was mentioned as "panelled with mottled kauri and rimu.... teak fittings on her decks. She was built for 1000pound, with not a shilling in extras. She had to be finished in every particular for that sum - dinghy, moorings and all, and she had to be delivered on her moorings after a trial trip. The owners got their money's worth. Such a yacht could not be built today for less than 2000pound and would probably cost nearer 3000pound." The Logan brothers, Robert Jnr., Arch and John left their father’s business in the early 1890s to set up on their own. Thelma, their first really large yacht, was built for marine merchants William and Alfred Jagger. She was launched from the Logans’ yard on October 30, 1897. The designer was Arch Logan, then only 32. 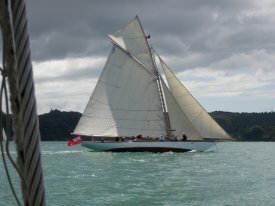 Thelma immediately became the scratch boat on the Waitemata, eclipsing the two former heavyweights Viking and the Sydney cutter/yawl Volunteer. Despite not being launched with a Maori name, as many yachts of the time were, she was decorated with maori carving inside. This was regrettably removed during restoration in the USA. In 1912 she was bought by J.L.R. Blomfield, the original owner of Viking. Subsequent owners were W.D. Wilson (1920) and H.R. Hume and G.E. Creagh (1927). Around 1938 thelma was converted to a yawl under the ownership of Peter John Annan. The chronicles of Thelma's sailing journeys for 1935-37 seasons were recorded by crew member Leo Amodeo and make an interesting read about cruising and racing in that era. In December 1940 she was sold to commercial photographer R.E.Johnson, who equipped her for a cruise. A confirmed pacifist he and a single crew member left NZ without permission. They were heading for the then neutral United States. Unfortunately for them they were arrested in Tahiti in 1942 and returned to NZ as conscientious objectors. Thelma was impounded and finished up in the hands of the US Navy in Honolulu then California, being used for R & R by the military officers for over 12 years. In 1954 Thelma was saved from the Navy scrap heap on Treasure Island San Fransisco by John (Jack) F Pruyn who sailed her for many years. Jack paid US$3000, the only other bidder only wanted her for the lead in her keel. Jack and his skipper, Ralph Harding, rebuilt Thelma's rigging and replaced a large diesel motor installed by the Navy with a smaller one. They raced Thelma on San Fransisco Bay and also down to Monterey. Pruyn said "we could take anything in the fleet if there was wind, when other boats started having trouble at 20 to 30 knots wind, Thelma was just getting going. She was also used as a family cruising vessel and Pruyn, his wife Dee and daughter Molly often cruised as far as the Sacramento Delta. Molly treasured her early days cruising on Thelma and after learning that Thelma had been returned to NZ and fully restored she travelled to NZ in 2014 to once again sail on her. She recorded her memories of "Thelma's Family Years" which her mother Dee aged 92 edited. Pruyn sold Thelma in 1960 for $12,000. Three subsequent owners kept the yacht in San Fransisco. One of these owners Jerry Ellis (bought Thelma in 1966) converted her for cruising by stripping out the interior and building a large dog house with a semi enclosed cockpit. Eventually Thelma gravitated to Berkeley, California where owner, Australian computer software magnate Phil Dickinson and his project manager Mike Rose, spent a year partially restoring her, before shipping her to France by air in a Russian Antonov cargo plane, where the rest of the restoration was completed. Based out of San Tropez Thelma competed successfully on the local scene, particularly in the prestigious Prada Cup classic yacht series. John Street spent a long time negotiating with Dickinson before successfully securing the yacht in 2006 for Euro200,000, completing a survey of her, and arranging to have her brought back to Auckland to be restored to her original racing condition. On arrival in NZ she was transported to Horizon Boats Ltd yard in Stillwater where the restoration was carried out at the same time as the other Logan boat owned by the trust, Gloriana. Thelma is a protected New Zealand antique under the Protected Objects Act 1975. Thelma was moved to Horizon Boats Ltd in Silverdale in September 2015 for maintenance work to her keel and repair to the top mast which broke at the hounds. The old lead shot was removed from the keel and a new lead casting made to replace this. Repairs to the keel, garbard planks, and top mast were completed by Horizon Boats Ltd. Paint repair, revarnishing mast, spars and bright work was completed by crew members and friends of the CYCT. Funding has kindly been provided through Crew funding initatitives, a Maritime Museum Foundation grant and Lion Foundation grant. 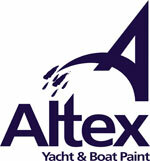 Varnish materials have kindly been supplied by Altex Coatings.